An unusual hotel with an unusual name, you’ll find the decidedly comfortable Daulat tucked down towards the end of Madras Street, yet still in the centre of Little India. 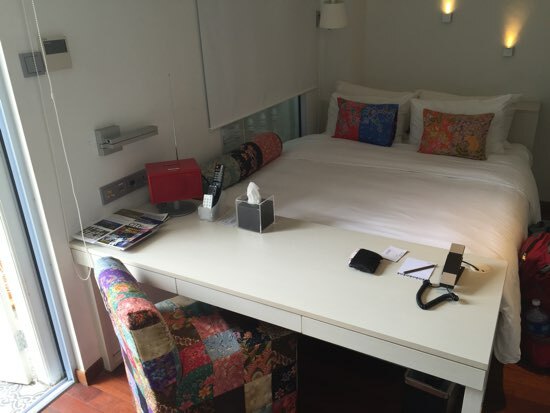 With good sized rooms, a lap pool and a boutique-y feel, this is the only hotel in this style in Little India and will appeal to those looking for something a little different. Ad Book now! Rates from US$93.16++. Average rating 7.9 from 537 reviews. 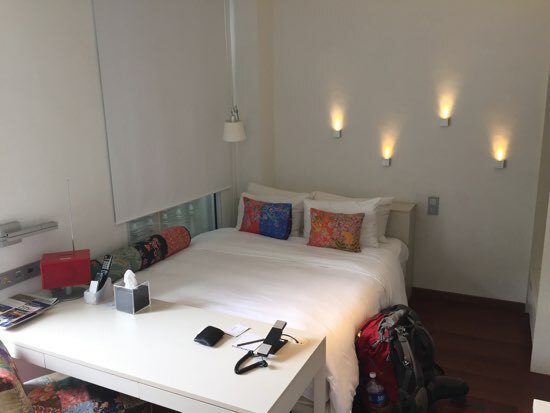 Rooms are tastefully furnished with comfortable beds with double pillows and throw cushions plus a decent reading lamp, wooden floors and compact but clean bathrooms (vanity is in the main room — not in the bathroom). In the larger deluxe rooms there is a good working desk at the end of the bed and the rooms are really quite spacious with plenty of cupboard storage, an iPod dock, large flatscreen TV, nespresso machine (but only two caps and no creamer!) and so on. 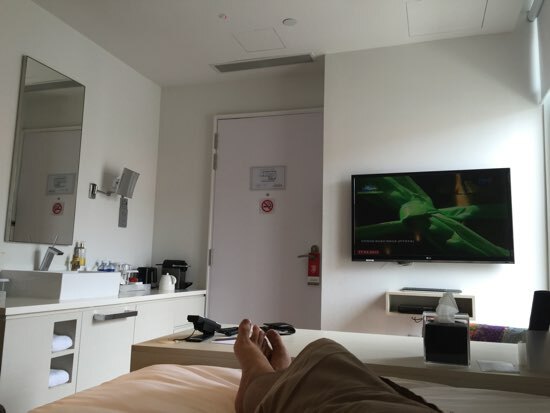 The hotel has high-speed WiFi throughout. Our only real gripes (and they are very minor) regarding the room is that it was already showing its age a bit with scuffed walls, stains around the coffee equipment and an orphaned TV mount, where the TV must have been previously — it was odd it hadn’t been removed completely. By Singapore standards, quite spacious. Not all rooms have windows, and while the extra sized deluxe with balcony may sound tempting, in practice you’ll pick up significantly more noise in the evening thanks to the neighbours. It’s also not really a lounging around on balcony, as it’s a little small and is shared with the other balcony deluxe alongside. The extra meterage would be good though. Light sleepers may need earplugs. On the second floor, an artificial lawn area wraps around the rear of the hotel and finishes at a lap pool, which runs down the other side of the hotel to streetside. Swim the pool’s length and you’ll be able to look straight down onto Madras Street (the street end of the pool is translucent). There’s no pool bar, but there is deck and lounge seating on the lawn area so you could bring your own drinks up for an evening dip. 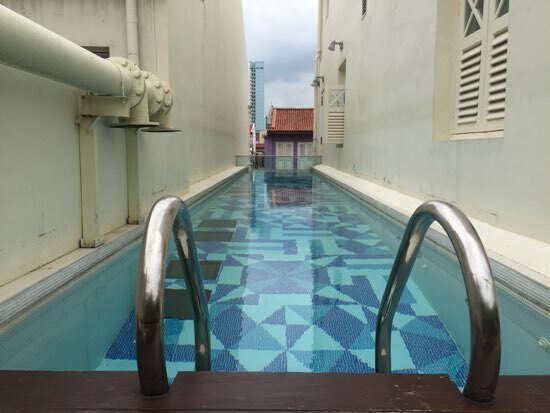 Few hotels in Singapore in this price-range have a swimming pool, so despite the pool’s modest size, this is a bit of a score. We’ve had far worse work stations than this! Down on the ground level there is brightly coloured streetside seating, along with a small cafe inside (where the very basic but complimentary breakfast is served). Guests are also able to avail themselves of the drinks here throughout the day free of charge. Sticking with the free theme, while we’re not sure just where you’d ride them, bicycles are available for free to guests. Staff were courteous and very helpful. Cool off with Little India views. Overall, you’re a serious step up from somewhere like the Perak, and in Little India proper there is nothing else quite like here — except for Wanderlust, of course. If you want something similar but in a different part of the city, Adonis near Bugis is well worth considering. Check rates at Daulat on Booking.com.